68 ethnic languages and dialects. English is also official in the archipelago of San Andrés, Providencia and Santa Catalina. Colombia (officially called Republic of Colombia), is a big country in South America. It is in the northwest part of the continent, and it has an area of 1,141,748 km² (440,839 sq mi). It is the only South American country with coasts on both oceans (Pacific and Atlantic). The capital of Colombia is Bogotá. The second major city is Medellín, a large industrial center. The third largest city is Cali, home of many multinational companies. The most important city of the country on the Caribbean coast is Barranquilla. It was also the first national port. Cartagena de Indias has a great Spanish wall from the 17th Century and an old town with 500-year-old buildings. After these cities comes Bucaramanga, a large city near the Venezuelan border, and the center of the textile industry in Colombia. 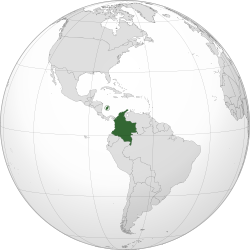 In 1819, Colombia, Venezuela, Ecuador and Panama declared independence from Spain, and formed a country called "Gran Colombia". Venezuela and Ecuador separated in 1830. Panama continued to be part of Colombia until 1903, at which point it proclaimed independence. The official language is Spanish, but there are many dialects spoken by minorities. The land where Colombia now stands has been home to people for more than 20,000 years. The first people had many groups, cultures, and languages. There are many tools, caves, and things of those peoples. In Colombia, the peoples were similar to those of Asia, because scientists say that the first people came to America from Siberia or South East Asia more than 50,000 years ago. The peoples of Colombia were called Arawak, Caribe, and Chibcha. But there were many other groups. The most famous were the Muiscas. legend of El Dorado comes from the Muiscas. The king of the Muiscas used to bathe in Lake Guatavita and he used a lot of gold for his bath. The Spaniards heard about this, and the people told them that there was a great golden city somewhere. They started to look for El Dorado. The International Airport of Bogotá is called El Dorado International Airport, because the legend was born in Colombia. The descendants of the first peoples of Colombia live integrated with others. Some groups live in the forest, but many live in the countryside and in the cities. 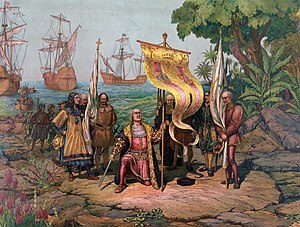 The Spaniards lead by Christopher Columbus discovered America in 1492. Columbus saw the coasts of Venezuela, Colombia and Panama and he gave them his own name. But Alonso de Ojeda was the first to explore the area of the Gulf of Darién. After that, the Spaniards founded the first European cities on the American continent: Santa Marta in 1525 and Cartagena de Indias in 1533. It was from Colombia that the Spaniards conquered the Incas of Peru. They founded the city of Popayán in 1536 and they conquered the Confederation of the Muiscas. In Bacatá, the capital of the Muiscas, the Spaniards founded the city of Santa Fe in 1538. In 1550 the Spaniards declared the territory as a colony and its capital was Santa Fe de Bogotá, but in the first decades it depended on Peru. Soon after, it was declared a Viceroyalty. Antonio Nariño was one of the most important persons to lead a movement for the independence of Colombia. He was a politician, journalist and soldier. Simon Bolivar, also a very important person in Colombia, was another one of the most important persons to lead a movement for the independence of Colombia. He was a president and a colonel. The geography of Colombia has six main natural regions. Each has its own unique characteristics. The Andes mountain region shares borders with Ecuador and Venezuela. The Pacific Coast region shares borders with Panama and Ecuador. The Caribbean coastal region shares borders with Venezuela and Panama. The Llanos (plains) shares a border with Venezuela. The Amazon Rainforest region shares a border with Venezuela, Brazil, Peru and Ecuador. The insular region includes all the islands of the country. The main rivers of Colombia are Magdalena, Cauca, Guaviare, Atrato, Meta, Putumayo and Caquetá. Colombia has four main drainage systems: the Pacific drain, the Caribbean drain, the Orinoco Basin and the Amazon Basin. Most of the population lives in the Andes region. But the plains make over half the land. Only about 6% of the people live in the plains. The Sierra Nevada de Santa Marta mountain range includes the country's tallest peaks (Pico Cristóbal Colón and Pico Simón Bolívar). Colombia's temperature changes with the altitude, and the temperature is different by region. The regions around the Andes are colder than the coast, which is lower. Because of the many altitudes, Colombia has many different fruits, vegetables and kinds of animals. It has many valleys, beaches, plains, mountains and forests like the Amazon Rain Forest. The top of some of the mountains in Colombia are so cold that people can ski over the equator. The lower mountains have warmer climates. The sea shores are cooled by ocean breezes. At sea level near the equator it is hot. Colombia is a megadiverse country. This means the country is home to a majority of Earth's species. There are also a high number of endemic species. Colombia has 1,900 species of bird, more than any other country. There are about 2,000 species of marine fish. It is the second most diverse country in freshwater fish. As for plants, the country has between 40,000 and 45,000 species. Colombia is second in the number of amphibian species and is the third most diverse country in reptiles. There are about 2,900 species of mollusks and about 300,000 species of invertebrates. In August 2010, Juan Manuel Santos became Colombia's president. Santos won the election on June 20 by a landslide. He promised to "preside over a government of national unity that will bring social prosperity for all Colombians"
Eight years later, conservative Senator Iván Duque Márquez was elected President and soon became the nation's latest president. He won the election by 2 million votes against his rival liberal Senator Gustavo Petro. There are several guerilla groups in Colombia, the FARC being the most powerful, a guerilla group responsible for kidnappings, murders, attacks, and drug-dealing. Drug dealing is a problem the government has been trying to fight. This creates violence in the cities. With Operation: Jaque, Ingrid Betancourt, three Americans, and 11 soldiers were rescued from the FARC. Medellín is known as "the City of the Everlasting Spring"
Cali, "the World Capital of Salsa"
Bogotá is the second largest capital city of South America after Buenos Aires and the third largest city after Buenos Aires and São Paulo. It is also one of the highest capital cities of the world, 2640 meters above sea level. It has a very active cultural, political, industrial and commercial life. Bogotá also has many international meetings, seminars, NGOs, organizations, universities, telecommunication centers and conventions. It is in the Andes. Many famous Colombians come from Bogotá like Rafael Pombo, José Asunción Silva and Juan Pablo Montoya. Eje Cafetero (Coffee Growing Axis) is the name of the region where coffee is grown in Colombia. There are three important cities: Pereira, Manizales and Armenia. ↑ "visibilización estadística de los grupos étnicos" (PDF). Censo General 2005. Departamento Administrativo Nacional de Estadistica (DANE). Retrieved 17 July 2017. ↑ 3.0 3.1 "Colombia". The World Factbook. Retrieved 16 July 2017. ↑ 5.0 5.1 "Animated clock". Colombian State Department. Retrieved 24 July 2016. ↑ 6.0 6.1 6.2 6.3 "World Economic Outlook Database: Colombia". International Monetary Fund. April 2016. Retrieved 17 May 2016. ↑ "socio-economic policies" (PDF). dane.gov.co. Retrieved 2 March 2016. ↑ "Natural regions of Colombia". colombia-sa.com. Retrieved 9 December 2016. ↑ "Colombia Celebrates over 1,900 Bird Species". proaves.org. Retrieved 9 December 2016. This page was last changed on 20 April 2019, at 20:36.